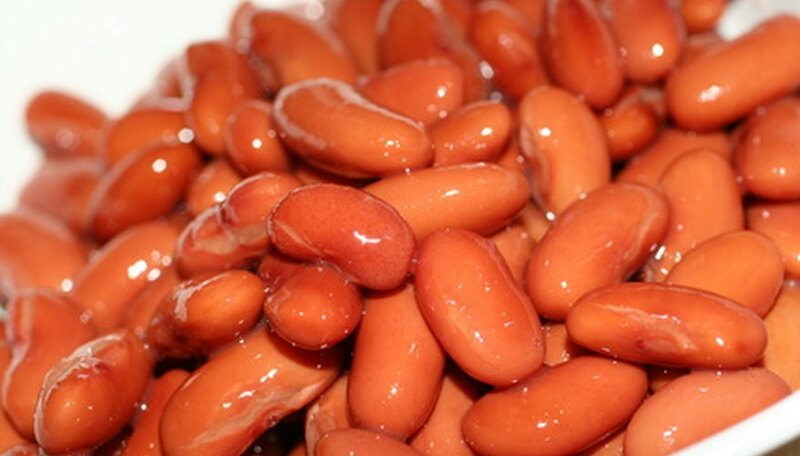 Red kidney beans are a versatile dried bean that you can grow in your home garden. Kidney beans grow on a bushy plant as opposed to a bean vine. Each pod holds up to ten kidney beans once mature, so the plant offers an abundant harvest for its size. Like most other beans, kidney beans are a simple crop to grow and harvest for the novice gardener, as they require only minimal care in order to thrive. Lay a 1-inch layer of compost over a well-drained garden bed in an area that receives at least 8 hours of sunlight a day. Apply 1 cup of 5-10-10 analysis fertilizer per 50-foot row, then till the compost and fertilizer into the top 6 inches of the soil. Plant the red kidney bean seeds 1 to 1 ½ inches deep, spacing them 10 inches apart in the row. Space rows 3 feet apart. Water the bed after planting so that it feels moist to a 6-inch depth if you stick your finger or a trowel into it. Continue to water the beans once a week in this manner, or twice a week in hot weather if the soil begins drying out more quickly. Spread a 2- to 3-inch layer of straw mulch under the bean plants once they are 6 inches tall. Mulch preserves soil moisture and prevents weeds from growing. Hand pull any weeds that do grow, as cultivation can damage the roots of the kidney beans. Pick the pods once they have dried and when the kidney beans rattle inside, usually in late summer. Pick pods as they mature so they do not become moist and rot while waiting for the other pods to finish drying. Split the pods open with your fingers. Shake the dried kidney beans out into a bowl or other container. Separate out any damaged, soft or diseased-looking beans and dispose of these. Place the beans into an airtight container and label with the harvest year. Store in a cool, dark and dry place until you are ready to use them. Plant kidney beans outdoors when all danger of frost has passed in spring. The beans are ready for harvest in late summer. If rain weather is expected around harvest time, pull up the entire bean plant. Shake the soil from the roots and hang upside down in a well-ventilated area until the pods dry completely on the plant. Kidney beans are toxic when raw. Do not eat the raw beans or grow them as edible sprouts.